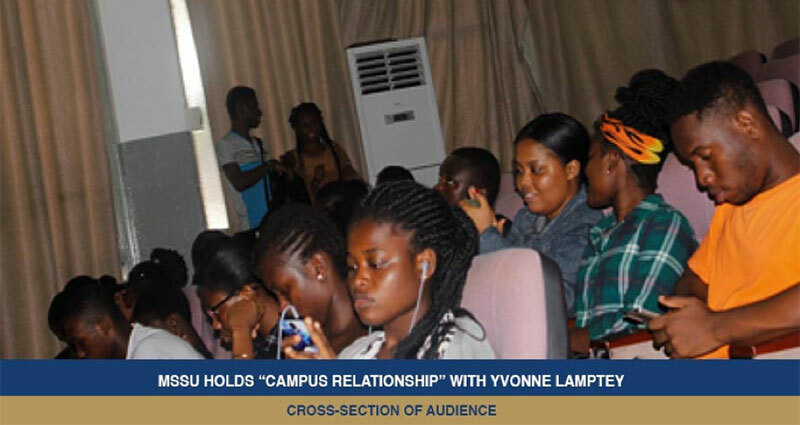 The Mentoring and Student Service (MSSU) of the University of Ghana Business School (UGBS), held a lecture on “Campus Relationships” with Dr. Yvonne Lamptey on Friday, 22th March 2019 at the R.S Amegashe Auditorium, The rationale behind the much anticipated lecture was to equip students with the requisite knowlege on how to handle campus relationships. Dr. Yvonne Lamptey, a lecturer at the Department of Organization and Human Resource was the main speaker. Present at the lecture were faculty members, students, executives members of the Business House Junior Common Room(BHJCR), along wtih the guest speakers Mr. Rowland Nana Takyi and Mrs. Pearl Afenyo. They were welcomed by the Assistant Coordinator of Mentoring and Student Service Unit (MSSU), Mrs. Rachael Hansen-Garshong. Speaking on the topic “Campus Relationships”, Dr. Yvonne Lamptey, highlighted on some models of dating, advantages, sources, variations and types of courtship. She said, sources of dating are through friendship, online dating sites, co-workers, family, college, church and others. The speaker futher stated that, every dating goes through stages, that is filtering stage one, where attraction of both partners is based on physical attraction, filtering stage two, which includes attraction based on political views and so on and so forth. According to the lecturer, effects of detoriated relationship can be managed by both partners, when they avoid thinking about each other, build high self esteem, and avoid inferiority complex. She further adviced that partners must be sure they can cope with a breakup before they do so. The guest speaker and former student of UGBS, Mr. Rowland Nana Takyi, shared interesting facts and experiences on his past broken relationships. Mrs. Pearl Afenyo also added her voice on her experiences on how her relationship started and ended up in marriage with the audience. In her words of admonition, Dr. Yvonne Lamptey cautioned students to look at weaknesses of people to ascertain whether they can cope with them, before go into relationships. Next, there was a question and answer session and the lecture was ended with vote of thanks by a member of the Business House Junior Common Room. The Mentoring and Student Services Unit (MSSU) is dedicated to the purpose of student career counselling, mentorship, stress management, job listing (internships), psychological counselling and scholarships. For more information, please visit our office at office number RT 35 on weekdays from 8:00am to 5:00pm.